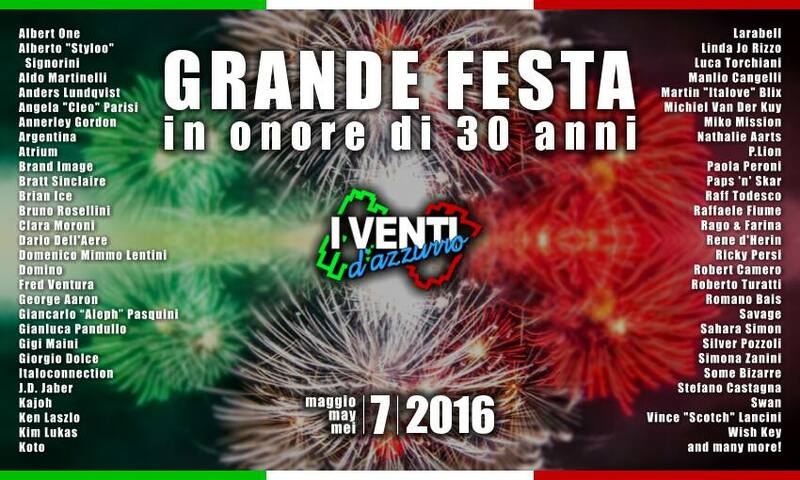 This weekend it’s the biggest Italo Disco ever.The number of artists that will join us is especially incredible. Just a small reminder that we will have the main event on Saturday and the pre-party meet and greet with Italoconnection full concert on Friday . Live performance from: Italoconnection, Fred Ventura & Paulo Gozetti. They will perform songs from their 2 albums, some brand new tracks, as well as some of Fred Ventura’s solo hits. The tickets for the show will be available at the entrance for 10 euro. Nearly all artists mentioned below here have confirmed their presence, but still: it could well happen that because of private reasons people could step back. Fred Ventura, Albert One, George Aaron, Anfrando “KOTO” Maiola,Vince “Scotch” Lancini, Clara Moroni, Brand Image, P.Lion, Savage, Italove, Linda Jo “ex-Flirts” Rizzo, Romano Bais, Giancarlo “Aleph” Pasquini, Larabell, Andrea “Bratt Sinclaire” Leonardi, Annerley “Ann Lee” Gordon, Michiel “Laserdance” van der Kuy, Marcello Catalano, Domino, Kaioh, Stefano Castagna, Evelina Somenzi & SCP Team, TQ, Roberto Turatti, Ken Laszlo, J.D.Jaber, Aurelio “Legend” Pitino, Retronic Voice, Giorgio “Atrium” Conti, Angela “Cleo” Parisi, Giancarlo Swan” Cinelli,Alberto “Styloo” Signorini, Dario dell’Aere, Raffaele Fiume, Robert Camero, Stephan “Juno Gang” Moser, Riccardo Campa, Luca Torchiani, understand that being present at this party will be unique, maybe a ‘ONCE in a LIFETIME’ ! This will be a Birthday-celebration Party, to raise a glass with everybody, in mixed-company so artists & fans united. It worked in 2006, it will work again this year. Just a reminder that all the fans will wear blue stickers and artists, producers, and record labels will wear red stickers with their names. This way it will be easier for everyone to recognize each other. Prepare yourself for the best Italo and italian weekend ever!